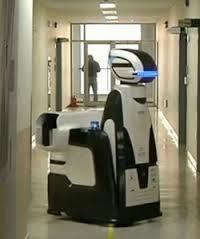 Robot prison guards will soon be patrolling the halls of a corrective facility in the city of Pohang, South Korea. The robotic wardens stand 1.5m high and move around on four wheels. They come equipped with cameras and other sensors that will help them to detect any unusual activity in the prison area. If the robots sense that a prisoner is likely to erupt into violent behavior or to attempt suicide, it will alert the human prison guards. The Korean prison guard robots are being developed by the Asian Forum for Corrections, a research organization that is concerned with advancing prison operation and criminal rehabilitation policies and technologies. The leader of the robot development team, Professor Lee Baik-Chu of Kyonggi University, told Yonhap News that the robots are to be tested in a month-long trial, set to take place in a Pohang prison in March 2012. The professor said that the developers are refining the design of the robots to ensure that they will appear friendly to the prison inmates. Indeed, in photos, the robots look disconcertingly friendly. Each one features a face that appears to be locked in a ‘beautific’ smile. You just may be reminded of the titular character of the movie Wall-E. The professor added that robots are tasked to patrol the corridors of correctional facilities, monitoring the inmates inside their cells. The robots are equipped with software that enables them to analyze the activities they are monitoring and to identify aberrant behavior. If the robots perceive that something dangerous is about the happen, they will sound the alert, but will not take action against the inmates themselves. Prof. Lee emphasized that the robots are designed to be helpers, not heavies. They can even open a communications channel from the inmates to the guards in the case of an emergency, such as an injury to a prisoner. Prof. Lee said that prison officials are open to the introduction of robot guards, as they believe the robots could help reduce the human guards' work load. Robot guards are expensive. The upcoming trial, sponsored by the South Korean government, will cost 1 billion won — the equivalence of $864,000 (USD}. However, they do offer certain advantages over human guards. Robot prison guards do not get tired, do not waver in alertness, and do not accept bribes. They also don't bleed when attacked with a makeshift weapon. Robots may be the ideal bodies for patrolling prisons during the night shift, the most unpopular worktime shift. So if robot prison guards prove to be a success in South Korea, we may soon start seeing them closer to home.